The new 179,300 sq. ft. five-story Patient Tower will replace the existing Patient Tower scheduled to be decommissioned per California’s Senate Bill. The new tower will become the focal point of Downey Regional Medical Center’s campus as well as the anchor for the second phase. The first floor lobby will serve as the main entrance to the campus. A main corridor on the first floor will separate patient and public circulation and serve as the main “artery” of pedestrian traffic. Surrounding healing and wellness gardens will help to create a therapeutic environment that welcomes patients, visitors and staff. 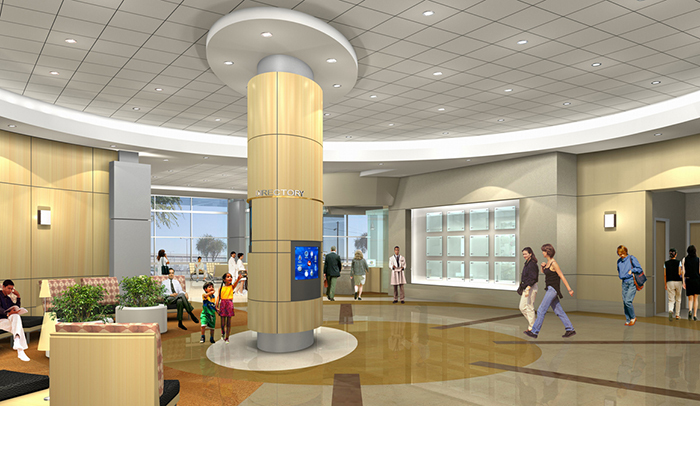 Upgrades to existing patient services will include new equipment and amenities. Patient rooms will be located throughout the third to fifth floors, with nurses’ stations at central bays, as well as satellite locations for better patient visibility and a higher level of care. The new Tower will serve as an anchor for the second phase. Constructability and circulation have been taken into consideration in these initial phases so as to optimize the operations of the future complete hospital.